Leadership is a skill best taught through real-life experiences and best learnt through real-life examples. to establish a FAT and Hungry culture (part I) – faithful. 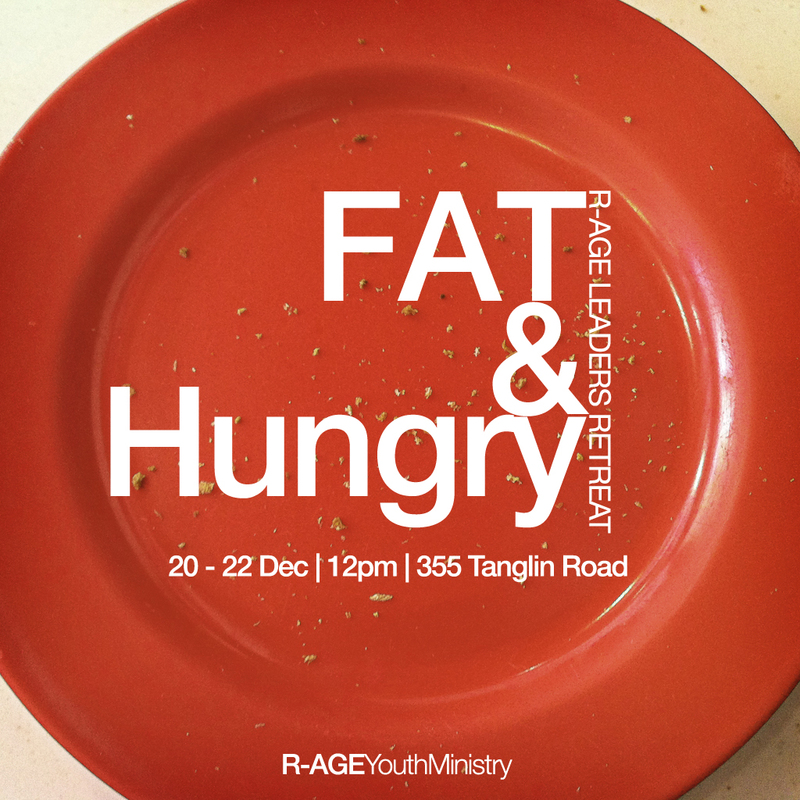 In the next few posts, I’ll share snippets of my vision casting sermons at the recently concluded R-AGE Leaders’ Retreat called, “FAT & Hungry”. In this three-day camp, I preached on four attributes that I’d like to see in my youth shepherds and leaders. The first is Faithfulness. The difference between faith and faithfulness is that faithfulness is our response to our faith. Let’s ask God to increase not our faith, but our faithfulness. Faithfulness is what we do with our faith. Faith grows only when we faithfully finish what God has called us to do. If we don’t finish what God has called us to do, our faith might not actually grow. On the contrary, it may shrink! Since I have put my faith in Jesus (to save me from hell and to take me to heaven), now I should be faithful to Him. Faithfulness does not mean “not being unfaithful”. If I say I am faithful to Huiyi, it means nothing if my faithfulness is about not acting negatively towards her but not doing anything positive for her. Faithfulness is not the absence of the negative, but the presence of the positive. Faithfulness isn’t only what we keep ourselves from but what we choose to invest ourselves in. Faithfulness is to be reliable, trustworthy, consistent and dependable. And these are rare virtues today. 1. Start enthusiastically in faith. The son who pleased the father wasn’t the second son said he’d do it but didn’t, but the first son who didn’t say he would do it but did it. Obedience not intention pleases the Father. Actions speak louder than words; many people have great intentions but no many follow through what they intended to do. No one gets rewarded for intention. Automobile pioneer Henry Ford once said, “You can’t build a reputation on what you are going to do”. Action not intention gets the job done. Let’s develop a tendency for action. If you feel God is calling or prompting you to do something to advance His kingdom, stop hesitating and just act on it. A thriving youth ministry must develop a culture of enthusiastic obedience by faith. After all, the proof of passion is in the pursuit. If I say I am passionate about Huiyi, then it’s only natural that you see my pursuit in action. But watch out for the perceived “what if” fears that stop us from taking action. We need to learn to pull these perceived fears into the light, for fear is a dark room where negatives are developed. Something that I’ve learnt from my mentor, Ps Benny Ho, is this principle called, “Ready, fire! Aim…” There are some who fire without getting ready – these do not hear from God properly. But there are some that just prefer to aim forever but never fire the first shot. This is similar to how you’d zero a rifle – you must fire the first shot to get a sensing before you calibrate your weapon. Remember, faith is to believe what we do not see and the reward of faith is to see what we believe. 2. Stay earnestly in faithfulness. I believe that faithfulness isn’t about doing something for a long time, but about doing something well at a particular season of life. Proverbs 25:19 tells us that unreliable people are like a bad toothache or a walking with a sprained ankle – it hurts! If we depend on an unreliable person, we can never quite relax because we’re wondering at the back of ours mind if the job is really done, and we’ve got to chase that person again and again. Come on, if we say we’re gonna do it, then do it! Let’s remove unreliability from our system and make reliability our greatest ability. Faithfulness is an attitude of the heart. We should faithful because God is faithful but also because God rewards faithfulness. The hardest part in both the marathons I’ve completed is in the middle part, when the going gets tough from around the 21st to the 32nd kilometre; the novelty of starting a marathon has worn off and the euphoria of the finishing line is beyond sight. That’s when tenacity gets us going. He put in years of hard work and was rewarded for it in 2008 when he received the ultimate individual accolade in football – the FIFA Ballon d’Or. He was now officially the world’s best player. In 2009, he became the most expensive player in the world when Real Madrid bought him from Manchester United for S$158,580,800. His annual salary in 2011 was S$47,070,692. Putting that into perspective, that means that Ronaldo earns S$128,961 everyday, S$5,373, every hour and S$90 every minute. After he finishes watching The Hobbit, he’d have been richer by S$16,120. Persistence and faithfulness will help us to start well and finish well. Let’s be like bulldogs – their noses are tilted upwards so that they can bite onto something and continue breathe without even letting go. That’s why they’re such ferocious canines! To Jesus Christ in their personal walk with God. To their respective teams (shepherds cells, leaders circles, youth and tertiary cells, service teams and event committees). To their responsibility (as cell leaders, service team or event committee members, in ministry and committee meetings and to see what they’re doing as spiritual leadership and not simply labourious work). 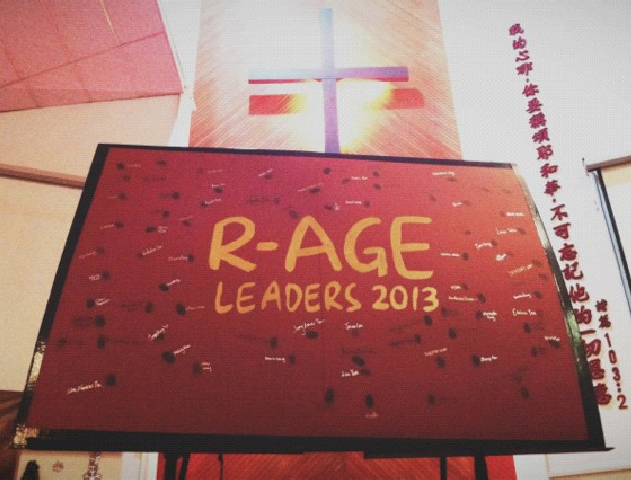 To pray for the youth ministry (R-AGE) and the church (Grace AG) both in their prayer closets and in corporate prayer meetings. To see evangelism as a part of their life and not a church event. The great missionary Hudson Taylor once said, “A little thing is a little thing, but faithfulness in little things is a great thing.” God can turn your faithfulness in a little thing that He has called you to into a big thing. The challenge for us is, are we able to do all the small little things that people won’t notice, and still be faithful in these things? Acts 6-7 records the entire life of Stephen. He was faithful, full of the Spirit and he stumbled into the ministry as a solution to a leadership problem and a simple need – to feed and care for widows that were being neglected. It wasn’t anything glamourous or the kind of job that one would take to get ahead or receive recognition from. And it certainly had little returns. I can imagine working with widows to be like working with youths. Both can’t give much back to you. But Stephen taught me that faithfulness is the little stuff you do that nobody sees and probably no one celebrates. He was faithfully doing his everyday duties until a group of people started to create trouble for him. And with it, he ended up preaching the sermon of his life. He preached the very best he could because once he’s done, he’d be with God. His life came to a tragic end in Acts 7:54-59, when he was tragically stoned to death. In the Scriptures, we often read that Jesus sat on the right hand of God. It’s mentioned once in Luke, Acts and Romans, twice in Revelation, thrice in Matthew and Mark, and six times in Hebrews. But read Acts 7:55-56 again and you’ll see something amazing. In Stephen’s case (and probably the only mention in the whole Bible) after he preached, he saw the Son of Man STANDING! WOW! Can you see it!? In my sanctified imagination, I can’t help but to see a standing ovation from Jesus to welcome Stephen into heaven! What a way to end his life and ascend into glory and honour – I want that for the end of my life! May we be a youth ministry that has a “finishing anointing” – to be youths who not only know how to start, but how to end. May all of us start well and end well. So that when we meet God face to face, it would be to hear him say, “Well done, you good and faithful servant!” and see Jesus giving us a standing ovation after that!